The stats show that there are just under 5,300 cases where children are not allocated a social worker. Tusla CEO Fred McBride has said the agency "doesn't do itself favours" with how it compiles figures. THERE MAY BE a backlog of well over 5,000 cases where children have not yet been allocated a social worker, but that doesn’t take into account the large chunk of these cases that are being “worked”, according to Tusla CEO Fred McBride. 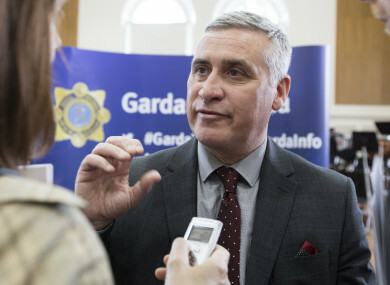 He told TheJournal.ie that the way the agency categorises its cases “doesn’t do themselves any favours” and going forward Tusla will describe its backlog “more accurately”. McBride says that while all urgent cases are actioned immediately, lower priority cases may be left waiting some time. In the Dáil earlier this month, Children’s Minister Katherine Zappone provided a breakdown of the high priority cases and how long children were waiting to be allocated with a social worker. In all, there were 357 cases deemed to be high priority that were awaiting allocation for more than three months. Also citing the matter in Leinster House, Sinn Féin’s Donnchadh Ó Laoghaire said that the number of unallocated cases shows a system at “breaking point” and a “national scandal”. But just because they’ve not been allocated, that doesn’t mean the child’s file is just sitting in a cabinet gathering dust, according to McBride. He said: “Out of that 5,000 or so unallocated, a significant portion are being ‘worked’. Between 1,500 and 2,000 are being worked by our duty team. What it means is that these children don’t have a dedicated social worker, but the duty team are doing work with them. They might have more than one social worker visiting them. I absolutely accept that is not ideal. But the cases are not sitting in a drawer being ignored, they’re being worked, reviewed, visited on occasion. It’s just that we don’t have a dedicated worker attached to them. McBride says that there are also a number of cases that are just waiting to be closed off. He said these cases have been assessed by a social worker who has decided that the case must be closed or doesn’t require to be moved on from an initial screening. Taking these cases into account, the true figure for unallocated cases is closer to 3,000 according to McBride. He said: “We’re not trying to manipulate the figures in any way at all, we’re just trying to tell it like it is. That still leaves a cohort of children who do need a social worker and don’t have one. Clearly, our ambition is for that to get it down to zero. We may never get it down to absolute zero. There has been a 79% reduction in high priority cases since January 2014 from 3,535 to 752, and McBride said that’s indicative of progress it is making. On Saturday, we’ll be publishing another story from our interview with Fred McBride, where he says negative media coverage has made it harder to retain staff. Email “'We're not trying to manipulate figures': Tusla says social worker backlog is lower than numbers suggest”. Feedback on “'We're not trying to manipulate figures': Tusla says social worker backlog is lower than numbers suggest”.